This small south facing gated of 17 modern villas has been designed to provide a contemporary functional home with large open plan living areas that connect the best of interior and exterior living spaces by the use of large windows, natural stone and top quality materials throughout. This unique development of just 17 villas is complemented by a family membership of La Resina Golf Club. 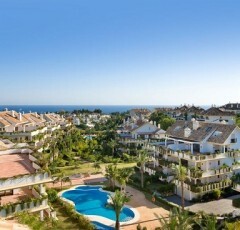 Situated in Estepona, in the New Golden Mile, The location is definitely a key factor and the ideal location of the development offers the best of both worlds a beautiful natural environment close to La Resina Golf Club yet only 10 minutes from the beach and all facilities and amenities perfect for a holiday home or permanent residence. Reinforced security entrance door in Wood with security lock. Double-glazing in all the exterior windows. Bathrooms: Corian surface unit with buit-in washbasin in the ground floor bathrooms and toilets. Hidrobox showers plate all the same level as the bathroom floor. Embedded bath in master bathroom. Wall-mounted WC Subway in all bathrooms and toilets. Complete kitchen, with Silestone workdop, bar in beech wood and NEFF appliances. Telephone an tv points installed in all bedrooms, and in the living room and kitchen. Air-conditioning with independent control for each room. Water surface area of 31 m2. Lawns are lad with automatic watering system in the free areas of the plot. Residencial area should has security services 12-24 hours. There are more villas with different meters and prices. REF: 05.100 Luxury Complex 2,3 & 4 Bedrooms apartments in Golden Mile. Marbella.